When Darlene found the Beachbody On Demand community, she realized she wasn’t alone in her struggle to get healthy and fit. 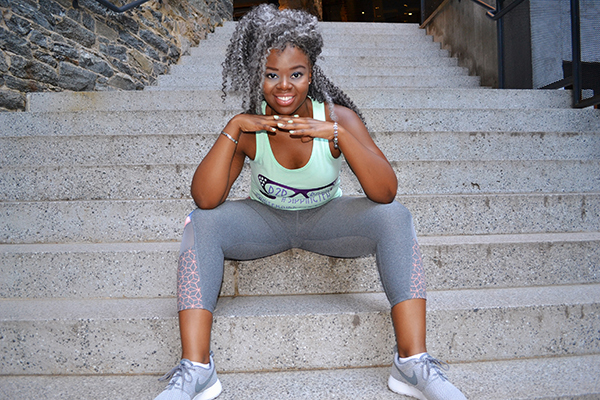 With the help of 2B Mindset and programs like YouV2, SHIFT SHOP, CIZE, and 80 Day Obsession, Darlene got in tune with her body and achieved the goals she never thought she could. “I tried my best to be body-positive, but the truth of the matter was I [was] miserable in the skin I was in. I felt like everything in my life was at an all-time low. I was depressed. My career was plummeting fast. I was in an abusive relationship, which didn’t help with my self-esteem. As far as my health was concerned, it seemed like no matter how long or hard I exercised I couldn’t keep my weight in a healthy range. My doctor told me I was morbidly obese. I felt like I was doomed to be stuck in an unhealthy body. Thank God there was a spark of hope left in me that I could be better. Then I got cast in YouV2. I felt so encouraged being surrounded by beautiful overweight women who wanted more out of life. They, too, weren’t particularly happy being obese, but they weren’t going to let that stop them! “For me, 2B Mindset is LIFE! I’m in control of what I eat and drink. I was an emotional eater; personal development helped me get to the root of the reasons why — I was molested as a child, raped in high school, date raped as an adult, a domestic-violence survivor, and diagnosed with polycystic ovary syndrome (PCOS). My Team Beachbody Coach introduced to me to my first Challenge Group and Shakeology — I like to call it #GodJuice! The Super Trainers seem as if they are literally in the room with you and they know how you feel when you feel it. They know when you feel like you’re going to give up, when the burn is seriously out of control, and when you just need some words of encouragement. Somehow, the Super Trainers say just the right things at just the right time! SHIFT SHOP was no joke. It challenged me and used moves I would never dream of attempting to do! I admired Chris’ drive. I also related to his journey, being a victim of sexual abuse myself. His story inspired me to keep pushing for it no matter what. It also helped me discover that my abs do exist! I figured if I made it through SHIFT SHOP, it was very possible I could push myself to do 80 Day Obsession. I had to modify all the way to the end, but I finished it! I absolutely love CIZE with Shaun T! It was so much FUN, even when I looked like a hot mess trying to get the moves down! I used to be discouraged at the gym. I knew people and staff would watch me work out and I felt self-conscious about it. I remember leaving a workout class early because I was ashamed I had to modify the moves. Yes, I have loose skin, stretch marks, lumps, and bumps, but I’m finally okay with it. My body feels, looks, and is stronger and more beautiful inside and outside now and is still changing for the better. I carry myself so differently now. Almost like I did when I was a child before I had a real care in the world. I feel good and in tune with my body. I had no idea how getting my health in check would influence all other aspects of my life. Sometimes I’m still dumbfounded [about] how that all works, but it most surely does. My self-esteem improved and I smile authentically now. Not the fake smile you give so people won’t know you’re suffering inside — that used to be me.